This review is going to be a bit unusual. Mostly because I already reviewed this book back in 2015. Back then, S.L. Huang was self-publishing. Since then, she’s gotten picked up by Tor and Zero Sum Game is being rereleased! I requested an ARC as I was curious what changes would be made; turns out I didn’t notice any big plot adjustments. So rather than write an all-new review, I’m going to take the text of my old review and insert bolded comments on how my perspective has changed (or not) on this second read. Zero Sum Game is an action-packed, speculative fiction thriller. Cas Russell knows there’s something different about her abilities – she’s very good at math, to the point where she sees the mathematics that underlie the everyday world. Thanks to this sixth sense, Cas can pull off amazing physical feats by almost instantaneously calculating the trajectory of bullets or the necessary angles and forces to win in a fight. Cas Russell might have powers, but she’s more a super-powered anti-heroine than a straight out superhero. People hire her to retrieve items for them, often illegally, and she has no compunctions about killing people she sees as a threat. In Zero Sum Game, Cas is hired to retrieve a woman from a drug gang and soon finds herself in the middle of something bigger. Something I really liked about the book was that Cas actually goes through some character development. Usually the stone cold, badass anti-heroines don’t start questioning their willingness to kill people the way Cas ends up doing. Through the course of the book, you also see Cas come to make connections with other people and start trying to trust them. This growth, combined with her awesome mathematical based powers, makes Cas one of the better anti-heroines I’ve come across. I still really love this aspect of Zero Sum Game. It’s sort of the start of creating the found family trope I adore. I am really interested in finding out more about Cas’s background since we only get hints in Zero Sum Game. Luckily, I got the feeling that future books will explore this more. I was right on target here. Similarly, I’d like to know more about the existence of other powered people. Besides Cas’s math abilities, you don’t see any other science fiction elements until quite a ways into the novel. In all, I’d say the book owes more to the thriller genre than superhero tales. Another plus point for me is that this is a female lead story without a romance plot. While I think there could be romance in future books, there actually wasn’t any in this one. Yes, there is some minor romance in the sequels, but it didn’t bother me. And there’s still not a trace of it in Zero Sum Game. On reflection, I wonder if this has to do with Cas being so isolated and only beginning to create friendships and stuff. I would really like to see a book where the heroine has close friends and is happy without romance, but I’m not going to pin that narrative wish on this series. It’s a minor thing, but I would have liked to see Cas work with another woman. All her principal allies in this one are men, and the only other significant female characters are antagonists. Hopefully, the next book will be different on this front. The next book did improve! Lack of women was still a complaint of mine on this second read through, but it helped to know that more female characters would be introduced in the next volume. 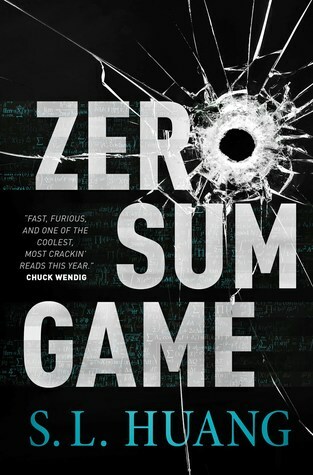 All in all, I found Zero Sum Game to be a fun, action-packed read that I would definitely recommend to anyone looking for a thriller for some light entertainment. I am keen to read the sequel. Having read more of the series and having reread Zero Sum Game, I would give this series an even stronger recommendation. The pacing is exquisitely fast, the characters are both interesting and likable, I love the emphasis on Cas forming friendships, and this series as a whole has gotten me through some tough times. A couple years ago I was depressed and having trouble engaging with any book, but I was able to binge read two of these books in one weekend. I can’t thank S.L. Huang enough for helping get me out of my head during a tough time. I will strongly recommend Zero Sum Game to anyone who needs a book to sweep them away! Yes, and now I can’t wait for Tor to release the rest of the series so I can reread them! That price increase though … urk. I don’t want to do any sort of anti capitalist rant or whatever, but you previously had the book for a fair price and, astonishingly, even under a Creative Commons license. Now for basically the same product new readers are supposed to pay 3-4 times as much? Doesn’t really have anything to do with the book (which I love), but that doesn’t feel right to me. I’m okay with it, partly because it’s the author’s choice and partly because now it will be easier for libraries to access, and so many more people will be able to read it that way.